Shackled by an outdated card program and its proprietary operating system, Nova Southeastern University (NSU) went looking for something bigger and better and, more importantly, a campus card that would enable the university to keep pace with technology. With its 27,000 students, NSU, located in Fort Lauderdale, Florida, is the largest independent higher education institution in the southeast and the seventh largest in the U.S. Founded in 1964, the not-for-profit university has branch campuses in Miami and Dania Beach, with the Dania location housing the Oceanographic Institute, and what NSU calls “student educational centers” in Tampa, Orlando, Miami, West Palm Beach, and Jacksonville, Florida, Las Vegas, Nevada, the Bahamas, Jamaica, and Puerto Rico. Nova’s current campus card would not have appeared to “outdated” to many observers. It was a smart card with a 1k and 4k chip as well as proximity capability and a magnetic stripe. The system offers physical access to buildings and parking lots on campus, acts as a library card, and functions for a host of payments. “Through the smart chip in a contact environment, users can pay at POS stations, use copiers, pay for print, laundry and vending,” said Mr. Brueck. But administrators felt constrained by the current system as they found it impossible to add functionality. In addition, they have several different cards –five in all – that are utilized for different functions. That was another reason the college needed change. Administrators wanted a single card – a true one card system. The college tasked Siemens Corporation, to start exploring what was available and what would work. “Siemens was already established providing infrastructure on our campus,” said Mr. Brueck. That included the college’s security system, including access control and cameras. SmartCentric Technologies, based in Ireland, has successfully installed campus card programs, based on its SmartCity system, at about 15 universities, mostly in the U.S., including schools in Orlando and Tallahassee, Florida. SmartCity is a multi-application smart card-based system that includes stored value, loyalty, gift cards, logical access, physical access, biometrics, car parking and ticketing. 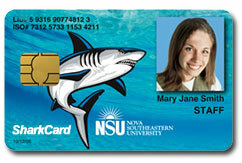 Every student – whether at the main campus, in the Bahamas, or in Orlando – receives a student ID card from NSU. However, it depends on what’s available at the specific campus as to what else the card can be used for, said Mr. Brueck. The SmartCity One Card., utilizes both contact and contactless technologies, Nova’s phase one applications will include student, faculty, and staff ID cards; cashless purchases at POS, vending machines, pay for print, meal plans; a web-based card revalue and card holder portal; and access control. The access control portion will incorporate both physical and logical applications and will use biometrics where needed. The card will be a combi-card with prox and an embedded 64 k contact chip from Siemens on the card. “Biometrics (for physical access) can go on either the contact or contactless portion. The contactless portion of the card will support prox technology so the existing investment in prox readers will be maintained,” he added. “We’ll be taking out existing readers on laundry and vending and replacing with our own readers. In the initial phase we’re aiming to replace what they have today: vending, laundry, POS, pay for print. “We want to go with single sign on and digital certificates, but whether we move in that direction or not, we’re currently evaluating,” added Mr. Brueck. The card-based digital certificate program would primarily be used at the university’s health care center. As to moving off campus, it will come, but not right away. “We know we’re going off campus,” said Mr. Brueck. “There’s a lot of interest from retail food establishments with what we’re doing and students want to be able to pay for services off campus. Web revalue will help with that functionality.” That’s one of the reasons the college is planning to place up to four purses on the card. In the e-ticketing phase, NSU cardholders will be able to pay for event tickets over the Internet and load the ticket to their NSU card, making entry to NSU’s University Center (opening in August) easier on the patron, said Mr. Timmins. To visit the NSU card program on the web, click here. To visit SmartCentric on the web, click here.